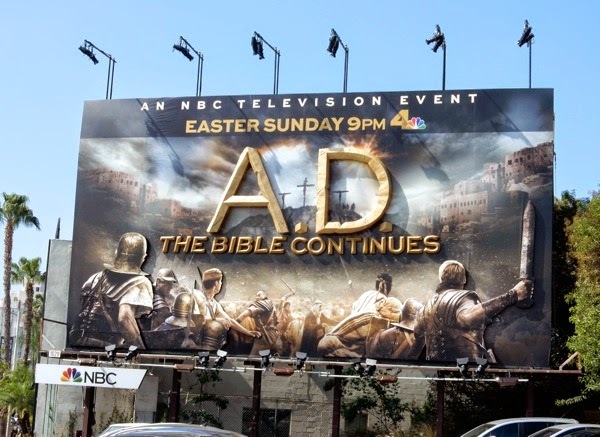 This Easter Sunday, NBC is turning to religion to help them with their ratings. 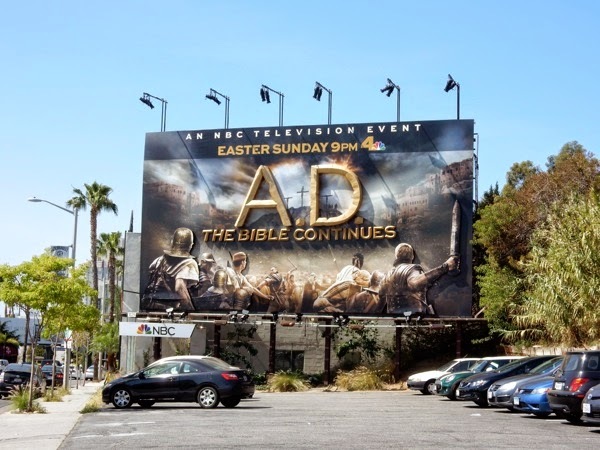 No, they are not praying for more viewers, but after the success of the History Channel's 2013 'The Bible' mini-series and 2014's 'Son of God' movie released in cinemas, the network is trying its hand at faith-based broadcasting. 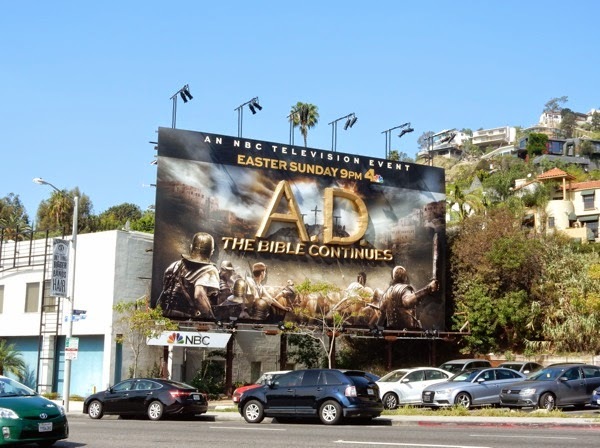 The 12-part series A.D. 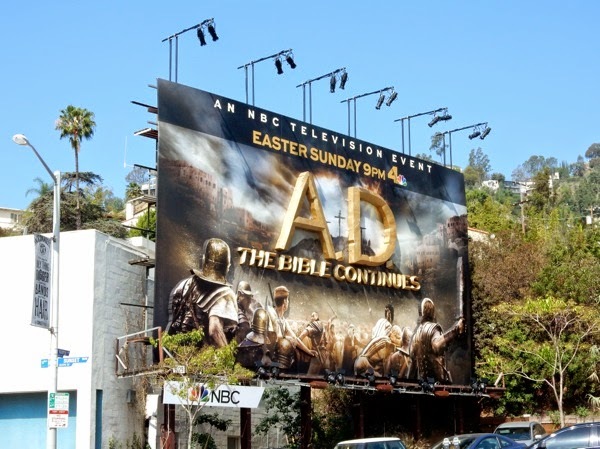 The Bible Continues starts airing tonight on Easter Sunday on NBC, and to help promote the Biblical drama the streets of L.A. are currently filled with these billboard ads, including this special 3D installation along the Sunset Strip. As you can see this special version takes the font effect of the show's title on the two-dimensional creative and embellishes it with 3D relief to really help it stand out spectacularly along L.A.'s heavily trafficked commuter belt. 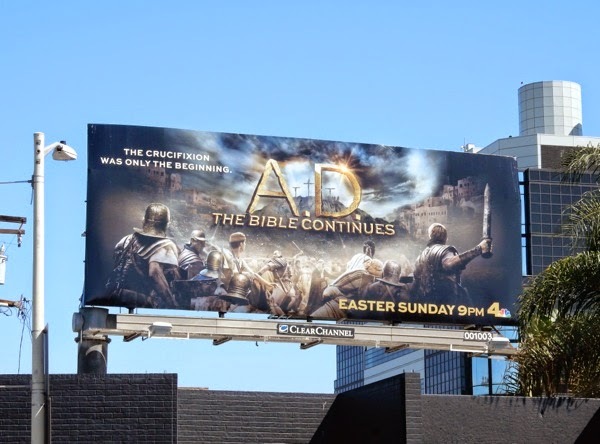 We're not quite sure if this TV mini-series event set after the crucifixion of Jesus Christ will be must-see viewing, but this billboard with its 3D design and impressive spotlights is certainly trying hard to grab passersby attention. 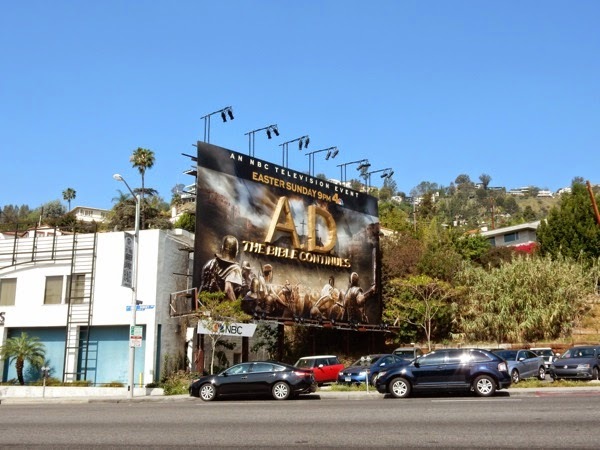 This 3D billboard was snapped on March 19 along Sunset Boulevard in West Hollywood, whilst the standard landscape version was photographed along Beverly Boulevard on March 23, 2015. 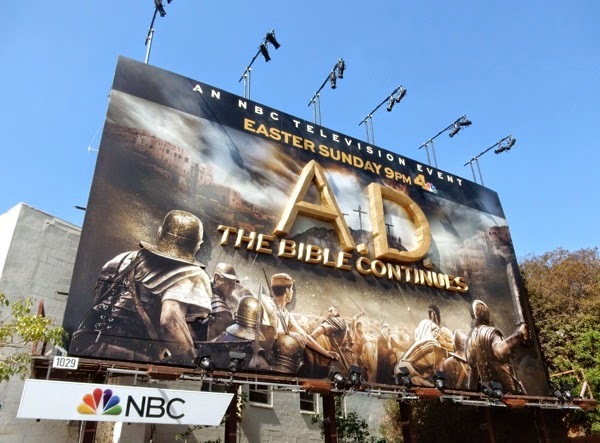 For more religious-themed billboards, be sure to check out these Noah movie billboards, Exodus: Gods and Kings film billboards and these Killing Jesus TV billboards. Let's see if this is only the beginning of historical religious dramas coming for your viewing pleasure in the future.